Mary Robinson recently contributed to BBC2 Radio series ‘What Makes Us Human?,’ in which high-profile figures in the realms of culture, philosophy, religion, politics and broader society addressed this difficult question. Mary Robinson recently contributed to ‘What Makes Us Human?,’ a series of written and audio contributions from high-profile figures in the realms of culture, philosophy, religion, politics and broader society, each giving their views on what they believe makes us human. Mrs Robinson’s article on the topic, published in New Statesman, is posted below, while her interview on the topic for BBC Radio 2’s The Jeremy Vine Show can be streamed on demand. To me what makes us human is best summed up in the African concept of Ubuntu, which Archbishop Desmond Tutu explains as “I am because you are”. I like to discuss with students why the word dignity comes before rights. What is this concept of human dignity? To me it is the inner sense of self-worth, the spiritual and cultural factors that are imbued in an individual which makes each one distinctive. The true poverty of the homeless person, lying in a doorway, invisible to the passer-by, is the lack of any sense of that self-worth and dignity. Human dignity evokes an empathy with the other, connects us one to the other. Empathy is extraordinarily important in family, in community, in country, at so many different levels. Now, in our inter-connected world, that empathy must expand to tackling the gross inequalities that raise issues of justice. In recent years my sense of what makes us human has been affected by an awareness of how destructive our activities are becoming to the planet and the ecosystems of which we are part. We have not been good stewards in many ways over the centuries and our fossil fuel led economic growth has had a toll on human health, biodiversity and the atmosphere. Very recently, for the first time in millions of years, we reached 400 parts per million of carbon in the atmosphere. This number is significant for at least three reasons; first, because a significant amount of the carbon was put there as a result of human activities; secondly because we are leaving the realms of a safe climate and heading for a 3-4°C warmer world; and thirdly because the results of a warmer world are already being felt as seasons change, rainfall becomes more unpredictable, sea level rises and extreme events such as floods and drought increase in frequency and severity. Climate change arguably poses the 21st century’s starkest challenge to human rights – including the rights to life, shelter and an adequate standard of living. This is particularly the case for many people in the developing world who have contributed the least to causing climate change but are disproportionately suffering the impacts each and every day. The poorest people and parts of the world emit negligible amounts of carbon into the atmosphere – while the wealthiest places and people emit the most and have the capacity and resources to adapt and build resilience to climate impacts. We know it is already tougher being a human being in some parts of the world than others due to the inequalities related to power and poverty. 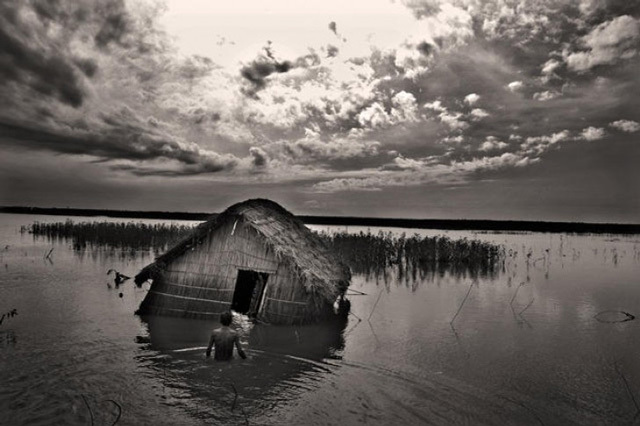 The impacts of climate change further undermine the human rights of the most vulnerable. As human beings we should be moved to address this injustice; this is climate justice. If human dignity evokes empathy and connects us to other people on the planet, then we have to care about climate change. Empathy, which is, I believe, what makes us human, must compel us to take responsibility for our actions and make a choice; a choice to change the way our societies operate to realise a safe world for all who inhabit it. We must empathise with those who are most affected by climate change –we have to hear the voices of the most vulnerable and then we must demand the action needed to keep the world safe. We also have to consider the needs of future generations and have a sense of intergenerational justice; to think of what our grandchildren and their grandchildren will say if we fail to act when we have the information and capacity to do so. This imaginative ability to hear future voices accuse us of failure to protect them is also part of what makes us human. It keeps me awake at night. BBC Radio 2 – The Jeremy Vine Show.